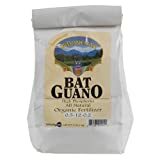 From the Far East comes Sunleaves Indonesian Bat Guano (0.5-12-0.2). With the highest phosphorus rating available in a guano, it’s an excellent addition to your fertilizer line. Perfect for encouraging multiple blooms and hardy root growth. 100% organic, suitable for all indoor and outdoor plants. May be used in a watering program or applied dry.